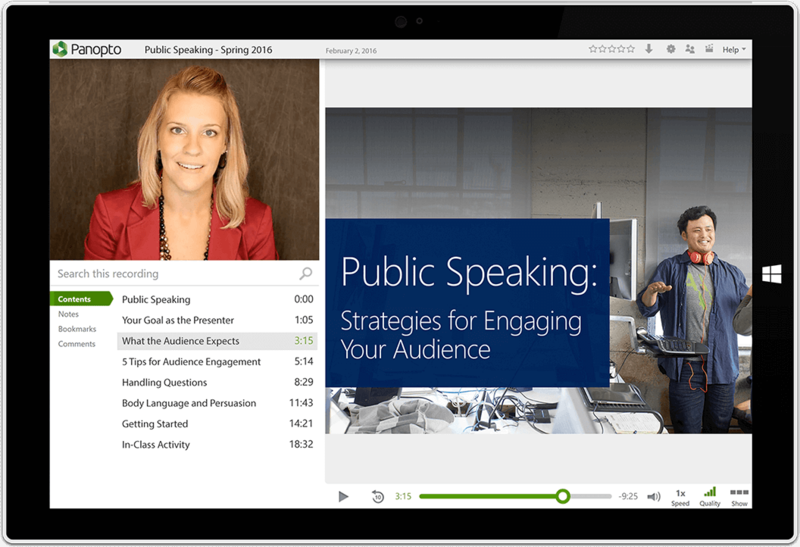 Ready to see how easy it can be to create and manage all of your video learning content? Request your 30-day trial of Panopto. Panopto is the easiest way to record video presentations, manage your existing video files, and stream your video content to any device. Ready to try it for yourself? Just fill out the form on this page to get started. If it’s a weekday between 7:00am and 5:00pm Pacific, our team will contact you in the next few minutes to answer questions and schedule you for a demonstration and a free 30 day trial of our video platform. If it’s after hours, we’ll be in touch the next business day. From simple webcam presentations at your desktop to complex multi-camera events, Panopto makes capturing professional video easy. Video used to require separate solutions for recording, streaming, and storage. With Panopto, everything is integrated, reducing cost and complexity. Panopto indexes the words spoken or shown on-screen in your new and existing videos, so your users can fast forward to the precise moment they need. Absolutely. After you fill out the form on this page, we’ll contact you to answer any questions and to schedule your demo. This initial discovery call helps ensure a good fit for Panopto at your organization, and it helps us tailor the demo to your specific needs. After the demo, we’ll set you up with a free trial of Panopto. You and your team will get full access to our video platform. This includes our video content management system for uploading and managing media files, our recording and live streaming apps for Windows and Mac, and our mobile apps for iOS and Android. During your free trial, you’ll also have access to our support team who are here to answer any questions you have. Our licensing model is very straightforward. Your annual subscription is based on the number of Panopto users within your business, or the number of full-time enrolled students in your university. The per user or per student price decreases as the number of Panopto users or students increases. There's an easier way to create and manage all of your learning videos. Fill out the form on this page and let us show you how Panopto can help.